Memory loss in people with Alzheimer's disease can be attributed to several factors. 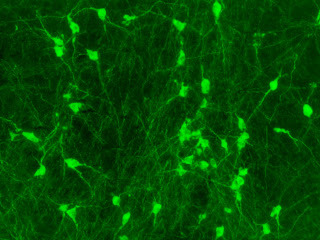 These include a build-up of the neuro-toxin Amyloid beta – the major component of amyloid plaques found in patients with Alzheimer's – and corresponding degeneration of a specific population of nerve cells in the basal forebrain. This page from my visual journal (left) is simply a rendering of the image above using coloured pencils. 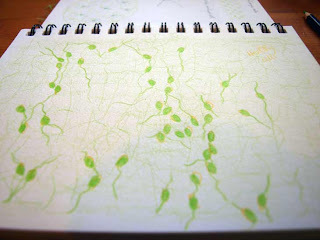 The process of shading, sketching and simulating was a useful meditation, although I don't plan for the next embroidery (indeed, the next three embroideries) to be a direct representation of these brain cells, but more of a series of visual comments on the life and death of cholinergic cells and their role in memory.